We left our lovely chalet in France a week ago today. Together we drove back to Geneva and then finally parted ways. Goodbyes to family are always the worst! 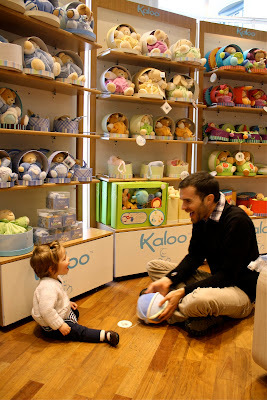 Our favorite discovery in Geneva, though, was an magnificent toy shop. Four levels, all toys! Lena had been napping in her Ergo carrier and what wonders she woke up to! I tried to get her excited about the amazing Haba toys from Germany, but she was more interested in the tags. Elliott was more interested in the tags, too, because when he saw the prices he said, "Not this time, honey." 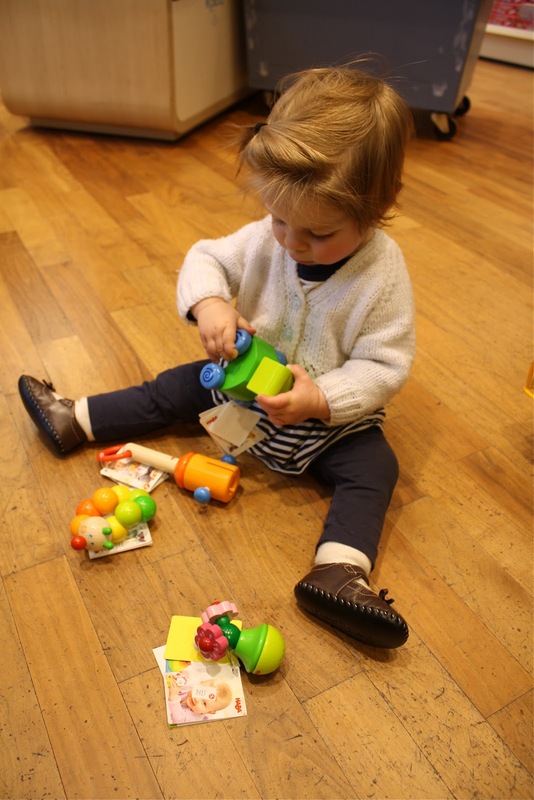 We loved this all-wooden toy set with beautifully painted people and animals. Elliott, in particular, was awed by the mountain goats. If we had a million dollars, we decided, we'd get this whole set for Lena. And for us. We both grew up with a small stash of Playmobil, so we were irresistibly drawn to this brightly colored wall of boxes. When will Lena be old enough for her first Playmobil set? Can't be soon enough for her parents! We have had our eyes on the veterinary clinic set ever since we spotted it in Solvang, California, this fall. And last but not least, a picture for my siblings and grandparents. 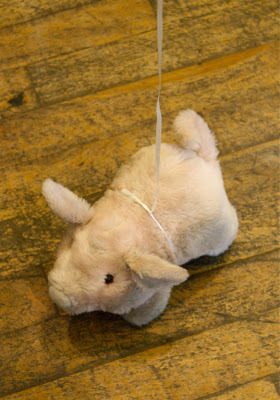 Do you remember the toy pig that Grampie gave us when we were kids that oinked and walked? They had one oinking and walking around the toy store! Elliott and Lena stared on in concerned wonder as I bent down in delight to pet the piggy and then took several pictures of it. Such a silly little toy... and yet what power it had to take me back to happy days of childhood! Fab looking toy store! I have some of those wooden animals from the last time I was in Switzerland. They are lovely. What about Playmobil 1-2-3 - that's for little kids and they have a really cute zoo - one of my friend's kids has it. such an array of toys brings back lovely memories and makes me excited thinking about grandchildren! imagine such winsome mountain goats :) no wonder you all enjoyed that store so very much. Playmobil never disappoint kids from making toys in accordance to our real world set up. They completed all the details of those set up to catch the attention of the kids and make sure that they will enjoy this.